Since 2010, Master Printer Carolyn Muskat has traveled to Hanoi, Vietnam three times to work with artists, teach printmaking and build connections. Sponsored by the Indochina Arts Partnership (IAP), Ms. Muskat’s first two trips involved the establishment of a lithography studio at the Center for Excellence in Graphic Arts at the Contemporary Art Center in Hanoi and teaching workshops. 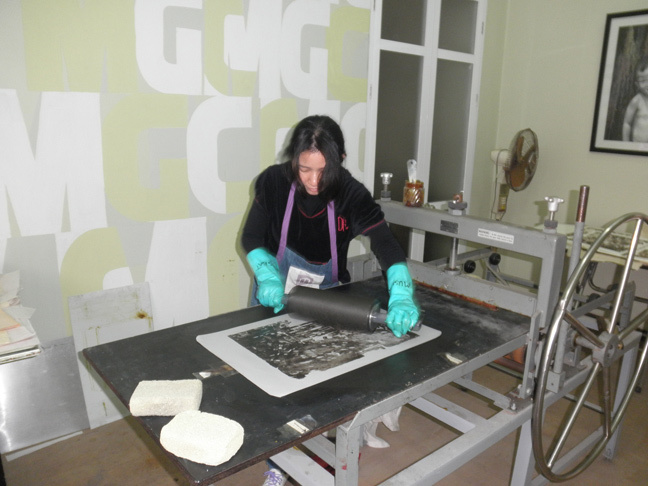 Working with many of the leading artists and educators in Vietnam, Ms. Muskat shared contemporary printmaking methods and taught both stone and plate lithography. In 2012, Ms. Muskat was awarded the Vietnam Art Medal, an award previously only given to four other non-Vietnamese artists. 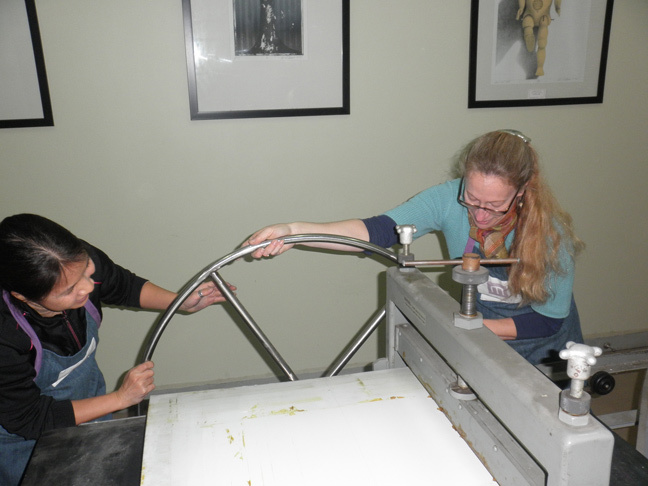 The Center expanded its lithography studio, and the group of artists invited to the workshop included university professors, artists, and graphic designers. Many of the participating artists went on to form the first ever printmaking club. In May of 2012, two artists who have worked at the CEGA and participated in workshops in Hanoi – Mrs. Vu Bach Lien and Mrs. Nguyen Vu Quyen – completed an artist-in-residency program here in the US sponsored by the IAP. The residency included working at Muskat Studios in Somerville, completing several editions of original work. In 2013, the Fine Arts Association of Vietnam hosted an exhibition of prints by David Thomas, Carolyn Muskat, Lois Tarlow and Gene Dorgan. In addition to the exhibition, Muskat taught her third workshop with the assistance of printers Jessica O’Hearn and Wayne Kleppe. She also participated in numerous interviews, artists’ talks, and visited the village where much of the local hand-made paper is made.